Portage will be featured by Emmy Award winning actor John McGivern as he explores living, working and playing in Wisconsin’s unique communities. 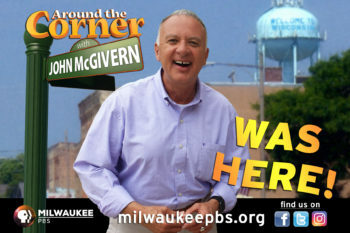 Around the Corner with John McGivern is a MilwaukeePBS production that began in 2012 to sho wcase Wisconsin’s fabulous communities through the stories of people as they live, work, and play in the place they call home. John and the show’s crew are now shooting Season 8. Filming in Portage has begun. After 94 episodes and 12 more scheduled for 2019, viewers look forward to discovering the new places John finds, and the people he meets along the way. This Emmy Award winning show also includes a short history of each community told by well-known Milwaukee historian, John Gurda. Radio host and John’s brother, Mike McGivern, tells what prep sport is popular in each town they visit. The new season of Around the Corner with John McGivern begins January 2019, with the Portage show airing March 28.